As far as I’m concerned the easiest way to explain an NFL prospect to the general reading public is to compare him to a current NFL player. Comparisons aren’t always perfect, but if you can at least visualize that type of player on the Packers it’s easier to understand what he might bring to the team. We included these player comps as part of our draft coverage last week, but I have some differing opinions and have had a little more time to think about these players. Just because I compare a player to a current player means that I have any expectation of that player reaching the level of his NFL comp. I’ll certainly indicate that it’s possible if I feel that way, but this is more about the way that they player goes about playing their position and what they bring to their team. With that said, I (and most of the NFL community) honestly think that Green Bay had one of the best 3 or 4 drafts in the league this past weekend so I am indeed excited. HaHa Clinton-Dix, like Eric Berry, is capable of doing everything well, but might not “take over the league” like an Ed Reed or Troy Polamalu. 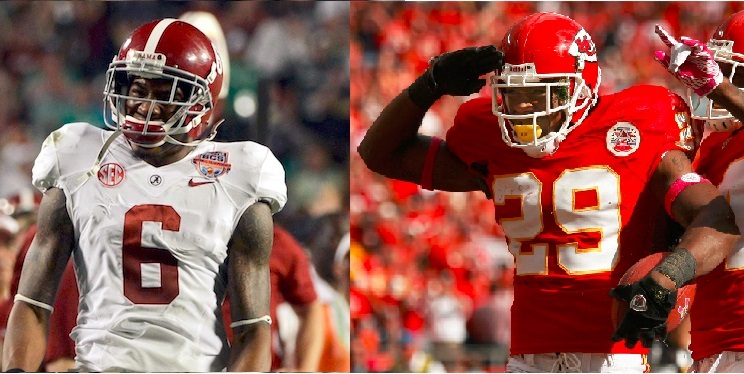 HaHa Clinton-Dix and Eric Berry had similar pre-draft experiences. Both players were viewed as one of the very best defensive backs in the country coming out of high school and each signed with high profile SEC schools. Both players decided to declare for the NFL Draft as an early entry and both players were viewed by most as the #1 safety in their draft class. Where the two players differed, however, was at the NFL combine. Athletically, Eric Berry tested through the roof and was selected in the top 5 by the Kansas City Chiefs, an extremely high position for a safety. 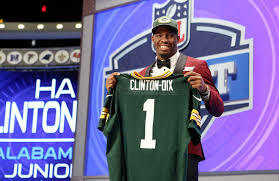 Clinton-Dix did not tear up the combine and went into the draft process being projected as high as #10 to the Detroit Lions, but fell to the Green Bay Packers at pick 21. I would say, mostly because of these “athletic shortcomings”, that it’s unlikely Clinton-Dix reaches Berry’s level as a player. It’s also true that the Green Bay Packers don’t need him to be Eric Berry in order to win another championship. The similarity between these two players to me is their versatility. Both players are at least “good” at everything. Both players can hit, both players can play the ball, both player can cover in zone and man and both players can play the run as well. One of the main knocks on the Clinton-Dix selection (as insane as it is) is that he may never be a truly elite player in the league. The idea is that he may never have the 9 interception All Pro season. Those don’t always happen, even for athletes of Berry’s caliber. In fact, Berry only has 8 interceptions over the course of his 4 year career, but when healthy has found a way to positively impact every aspect of the Chief’s defense. Davante Adams and Michael Crabtree were both insanely productive in college, not due to elite athleticism but the ability to get open and attack the football at it’s highest point. Davante Adams and Michael Crabtree both played in video game style offenses in college. Both players put up ridiculous numbers throughout their college careers. Despite only having played 4 seasons between the two of them (both players declared for the draft after their redshirt-sophomore seasons) they combined for a staggering 79 touchdowns. Neither player’s combine performances were earth shattering but neither player is by any stretch of the imagination unathletic. As evidenced by the touchdown numbers, both players are exceptional red zone threats, but their effectiveness doesn’t end there. The ability to attack the football at it’s highest point and secure the catch with their hands (away from the defensive back) and run after the catch are strengths for both players. Neither player have elite size or speed (both players are about 6’1″ 215 and run the 40 in the mid 4.5s) but you’ll never see either one lose a jump ball or get caught from behind. Michael Crabtree might (and I do mean might) have a little more talent than Davante Adams, but he’s never played (and probably won’t ever play) with a quarterback at the level of Aaron Rodgers. He also wasn’t able to learn the position from a player the caliber of Jordy Nelson (Boldin just got there in 2013, Crabtree’s 5th seaon). Davante Adams absolutely would have been a first round pick in almost any other draft with almost any class of wide receivers, and had he been in the 2013 class of wideouts would have been the 3rd or 4th wideout selected. The highest ceiling that a young receiver in this league is going to reach is probably within the confines of the Green Bay offense so long as #12 is still taking the snaps. Adams has a ton of talent and a bright, bright future ahead of him. Khryi Thornton and Shariff Floyd have almost identical measurables and do both of the same things well. They also share a lot of the same struggles. Both Khryi Thornton and Shariff Floyd stand about 6’3″, weigh about 300 pounds and have (positionally) short 32″ arms. Both players at their best are disruptive penetrators. Both players have the capability of re-establishing the line of scrimmage in the backfield. Both players are adequately strong to play their position effectively. Where both players struggle is with consistency. It’s a little insane to expect a defensive lineman to shoot through his blocker and make a play in the backfield on every down, but the ability to still affect the play when that doesn’t happen is essential to being an effective NFL defensive lineman. Floyd struggled with that in his first year and is being (unfairly) labeled a bust. I think the biggest reason that Floyd was a top 25 pick and Thornton came off of the board in the 3rd round is age. Floyd shows all of these characteristics (and potential) and was drafted when he was just 20 years old. Thornton, a redhsirted senior is 24 now, going on age 25. The fear you have with Thornton that you don’t have with Floyd is that he might not get any better. 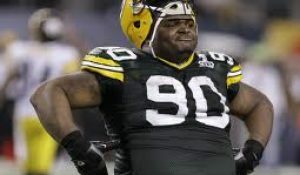 The upside is that he’s a disruptive player in Green Bay’s defensive line rotation for years to come. 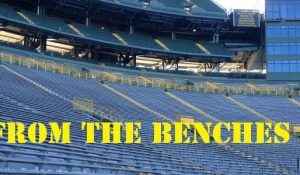 Both Owen Daniels and Packers 3rd round pick Richard Rodgers were considered as options this off season to solve the Packers red-zone woes. Daniels did visit Green Bay but signed with the Baltimore Ravens. I honestly found Rodgers’ comparison one of the most difficult, even after watching a little bit more of his play. He certainly had a strange transition into the NFL. Rodgers was a traditional tight end playing at a traditional tight end’s weight of 265 pounds. When new Cal coach Sonny Dykes came in, he told Rodgers that he needed to lose 15 pounds or they weren’t going to be able to use him. Rodgers operated primarily out of the slot as a big target over the middle of the field and moved away from some of the things that are traditionally handled by tight ends. Owen Daniels spent all of his time in a traditional offense at Wisconsin and then in Houston. Neither player is going to jump off the page athletically at you. But this doesn’t mean that Rodgers isn’t going to be an ineffective player in the NFL. Truly, how many dynamic tight ends are left in the NFL? With Jermichael Finley probably being forced to retire and Aaron Hernandez in prison aren’t we basically left to Jimmy Graham, Vernon Davis and (maybe) Eric Ebron? Gronk is certainly a dynamic player but at this point in his health are you confident that you can send him downfield to attack linebackers and safeties for 16 games? Julius Thomas probably counts but we’ll see if he can do anything after Manning retires. By this “dynamic” measure does it mean that only 3 or 4 teams in the league have good tight ends and the rest of us are screwed? I think not. Rodgers is certainly a good enough athlete and just like Daniels attacks the football, especially in the red area. If Rodgers can produce in that area, like Daniels did (26 TDs in his first 7 seasons) sign me right up. Carl Bradford and Lamarr Woodley are eerily similar physical specimens. Green Bay Packers fans would be over the moon if Bradford provided a Woodley-like impact. 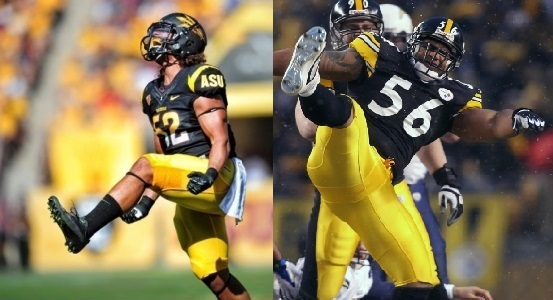 Carl Bradford and Lamarr Woodley are so physically similar that it’s almost frightening. 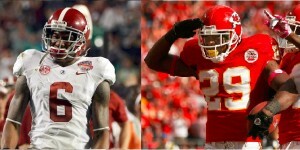 Both played defensive end for BCS conference teams but projected as linebackers in the NFL. Bradford measured at a stocky, compact 6’1″ 252 pounds, Woodley just a fraction bigger at 6’2″ 265. They ran nearly identical 40 times of 4.76 and 4.74, respectively. Their vertical leaps were almost identical as well, with Bradford reaching 37.5″ and Woodley 38.5″. Woodley may have had more upper body strength (29 reps) than Bradford (23) but Bradford lower body burst tested slightly better in the broad jump with a staggering 10’2″ compared to 9’9″ from Woodley. For years now, Packers fans have been pining for the Woodley to Clay Matthews’ James Harrison. It would appear that, at least physically, they have found him. Obviously immediately placing the expectations of a 4th round pick in Woodley’s stratosphere is dangerous business. I’m not doing that. I think that Bradford’s best case scenario is having Woodley’s career. Best case scenarios are by definition unlikely. Both players are compact and explosive, and both players are athletic enough to cover. The main difference between the two (and why they were not selected in the same round) is that Woodley was and is a more skilled pass rusher than Bradford. 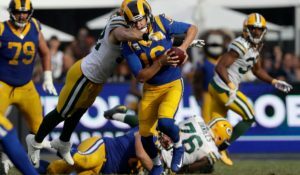 What the Packers (and I) are hoping are that Bradford develops these moves to go along with his obvious physical gifts. 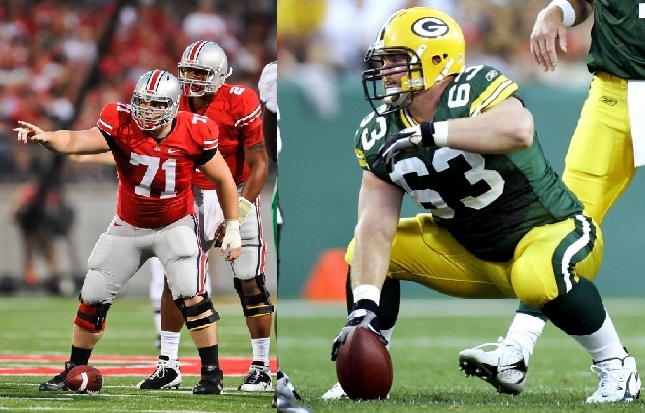 Corey Linsley and Scott Wells were both considered “smallish” for their position, yet Linsley could fit into the Packers scheme as Wells did. When the Green Bay Packers selected Corey Linsley in the 5th round, I, along with the rest of Cheesehead Nation was a little surprised. Ted Thompson hadn’t ever drafted an honest-to-goodness center after all. The last time the Packers did that was when they selected Scott Wells out of Tennessee. The two players are very similar. Both players played for big time schools. Both players are considered a little small for their position, though both men stand about 6’3″ and weigh in right around 300 pounds. Physically, at least, Linsley might even be more impressive. He was able to perform a very impressive 36 reps at 225 in the bench press. His max is said to be over 500 pounds and NFL.com describes his squat max as “a small house”. The weaknesses that Linsley portrays, besides height and weight, are a perceived lack of athleticism. His ability to get to the second level is certainly in question, but in a phone booth I’ll take Linsley every time. Linsley may never be a dominant player, and neither was Wells. 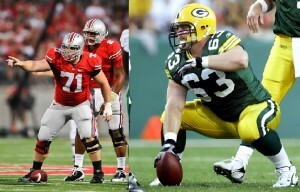 What Wells was and what Linsley can be, is an effective anchor for the Packers offensive line. Both Jared Abbrederis and Robert Woods are effective receivers and returners despite a lack of elite straight line speed. Last year the two receivers that I stumped for for the Packers to draft were Keenan Allen of Cal and Robert Woods of USC. Allen of course exploded on to the scene and nearly won the NFL’s offensive rookie of the year award. Robert Woods had a little bit of a tougher time (probably due to some QB issues). He certainly still posted respectable numbers for a rookie wide out and I still believe he’s going to be a productive player. I think I see that same type of player in the Packers 5th round pick, Jared Abbrederis. The two players are very physically similar. Both players are between 6’0″ and 6’1″ and between 195 and 200 pounds. They ran their 40s right at 4.50 seconds. Woods has a slighlty better leaping ability (33.5″ to 30″) but is not quite as quick as Abbrederis (3 cone drill 7.15 to 6.80). Abbrederis needs to work on his upper body strength whereas Woods probably does not. Where you really see the similarities is when you turn on the tape. Both players were extremely productive, yet their production didn’t necessarily come from being a superior athlete to the guy covering them. Both players were able to get vertical, even though they only posessed 4.5 speed. Both players were successful as returners despite lacking “elite” measurables for a returner. My hope for both of these players is that they get an opportunity. For Abbrederis the question is whether or not he’ll be able to be used. For now, at least, it appears that he will be behind Nelson, Cobb, Boykin and Adams for snaps at the receiver position. Even in an offense as diverse as Green Bay’s that might not mean a whole lot of opportunities. For Woods the hope is that he gets some help at the QB position. He certainly shouldn’t see a lot of double teams now that Sammy Watkins is on the squad. Demetri Goodson, like Packers CB Tramon Williams did not take a well traveled path to the NFL, and like Williams may not make an instant impact on the Packers (or any other) roster. As an undrafted free agent, it took a while for Tramon Williams to become an elite corner. He took an odd way to the NFL, playing at a small school (Louisiana Tech). Demetri Goodson certainly took an odd way to the NFL. He was the point guard at Gonzaga University for 3 seasons until he decided that he wanted to play football and caught on at Baylor. In a league where big corners are appreciated, both Williams and Goodson are just a hair under 6 feet tall and nearly 200 pounds. Goodson is still learning the position, and with his athletic gifts, one has to think the reason that he slipped to the 6th round is a combination of his lack of refinement and his “advanced” age. Goodson is already 24 and will very soon be 25 years old. By comparison, Sam Sheilds, who started in Super Bowl XLV is only 26. The way that the Packers run their operation, it would appear that Goodson will probably only get one contract with the team. After his 4 years are up, he will be 29 and it would seem unlikely that unless he vastly outplays his draft position that he will be kept into his 30s. What I think he has to hope for is to learn from Joe Whitt for a year and then if the aforementioned Williams and/or Davon House leave the team after the 2014 season Goodson might be ready to make an impact, he certainly looks the part. Jeff Janis and Terrell Owens were both small school freaks of nature that got by on their athleticism in college. Owens became an all-timer, will Janis? Of all the Packers’ picks the most difficult player to figure out was Janis. You’ll see a lot of the obvious comparisons. Jordy Nelson, Eric Decker, etc. While yes, Janis is a tall, white wide receiver he’s also way more athletic than both of those players and way less refined. Ted Thompson said of the 1,000 or so college wide receivers that his scouting department kept metric track of Janis was the second best athlete. Second best. The main question about Janis is level of competition. The same could be said for UT-Chatanooga’s Terrell Owens, who lasted until the 89th overall pick despite being 6’3″ 220 and running the 40 yard dash in 4.40 seconds. Janis checks in at 6’3″ 219 and ran the 40 in 4.42. He couples that speed with a 6.64 second 3 cone drill, a 37.5″ vertical and an astonishing 20 reps on the bench press. Both players were able to coast on their athletic ability, obliterating small school competition. What helped Owens develop into a possible hall of famer was combining his athletic ability with the tutelage that he (probably) got from the greatest receiver of all time, Jerry Rice. While Jordy Nelson is no Jerry Rice, it would at least appear that Janis will have an opportunity to learn the game from some quality veterans. Setting the bar for Jeff Janis at Terrell Owens level is insane and really not at all where I project his career to go, but he has the athletic ability to be that kind of player. It’s highly unlikely he gets there but he could certainly be an NFL difference maker for years to come. This entry was posted in Packers 2014 - 2015 Season and tagged 2014-15 season, player comps. Bookmark the permalink. Thank you Scott! Thanks for reading and I appreciate the feedback! The Jeff Janis comparison is as crazy as it is exciting. Janis was my favorite “sleeper” WR in the draft because of the similarities in numbers to Charles Johnson (7th round, 2013, Packers) who unfortunatly didn’t get to play for us. Johnson felt like unfinished business to me, I hope this preseason Janis fills that void that Johnson left last year.